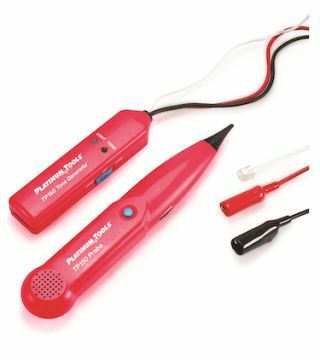 The What: The Platinum Tools Tone and Probe Set quickly traces and identifies cable locations on jacks or through walls. The What Else: With the Tone and Probe Set, wire bundles are easily penetrated with the tapered probe tip and the probe volume is controlled with a thumbwheel. With common send-and-receive frequencies, the TP150 is versatile enough to be used with other tone generators or probes. The probe features a recessed push button, which activates tone scanning when needed. The tapered tip allows easy penetration of cable bundles, the side thumbwheel adjusts volume and turns off power to reserve battery power, and it has a sensitivity of 100Hz–300KHz. The tone generator features include a slide switch to select TONE/OFF/CONT, a continuity mode to verify if a wire is broken, alligator clips to test pairs, and an RJ11connector for data or phone lines. The set includes a carrying case and 9V batteries.